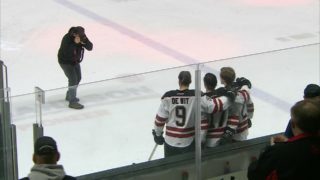 The Red Deer Rebels are headed to the Western Hockey League playoffs. The Rebels clinched their post-season berth Saturday night at the Centrium and they did it in style — decked out in Don Cherry themed jerseys — with an exclamation point added for good measure. 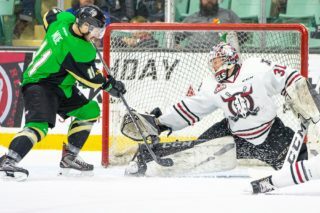 Brandon Hagel netted three goals, Kristian Reichel added a pair and Ethan Anders stopped 34 shots as the Rebels downed the Medicine Hat Tigers 5-2 in front of a large and jacked-up throng of 6,100. The victory capped an amazing journey by the Rebels, who in late January looked pretty much out of the playoff picture but have now won 16 of their last 23 games. 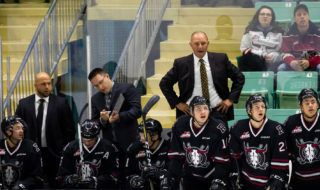 “You look back to Jan. 24th, we were 12 points out of a playoff spot and to accomplish what we accomplished says a lot about the kids inside the room,” said Rebels GM/head coach Brent Sutter. The Rebels trailed 2-1 after two periods but Reichel pulled the hosts even early in the final frame. The Czech forward, from the high slot, zipped a shot over the shoulder of Tigers goalie Michael Bullion following some strong work by Arshdeep Bains and Zak Smith — who each drew an assist — just inside the Medicine Hat blueline. With Tigers veteran defenceman David Quenneville serving a hooking penalty, Hagel shovelled the puck home from the edge of the crease at 15:50, and the Rebels sealed the deal in the final minute. With Quenneville off for slashing, Hagel and Mason McCarty headed up ice on a two-on-one break and Reichel, as the trailer, put the wraps on a nifty three-way passing play at 19:08. Then, with 39 seconds remaining, Red Deer defenceman Ethan Sakowich forwarded the puck up the boards to Hagel and the Buffalo Sabres draft pick added an empty-net goal to complete his hat trick. The Rebels were the better club in the opening period which ended in a 1-1 draw, but the Tigers carried the play in the middle frame and got a go-ahead goal from Bryan Lockner at 3:42. Anders, though, stopped the other 13 shots he faced in the period to give his team a fighting chance the rest of the way. “We had some moments in the second where we weren’t as assertive as we would have liked to have been, but the kids just kept going,” said Sutter. “They didn’t get down, they just kept playing. We talked about it after the second period . . . let’s get back to being a good team in the third and see what happens. Everything else speaks for itself. The Tigers got a power-play goal from Kristians Rubins 5:37 into the contest when his point shot found its way through a crowd and into the back of the net, but the Rebels responded quickly — a mere 28 seconds later — with Hagel tipping home a feed from Hunter Donohoe. The Rebels erased the Tigers’ next three man advantage opportunities and finished two-for-three on their own power play. “Outside of that first goal our PK did a great job for us tonight and then we obviously capitalized on the power play,” said Sutter. “We were moving pucks quick, getting pucks to the net and getting pucks into the lanes that were open,” said Hagel of the team’s man advantage success. 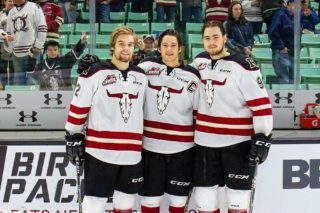 The Hagel-Reichel-McCarty line, as was the case in Friday’s 4-1 win at Lethbridge, was on fire. The trio, in fact, has been a force over parts of the past seven weeks. “We’re our top players, everyone knows it,” said Hagel. “We have to be our best players, Brent harps on it all the time and we’re bearing down. As Sutter noted, it’s crucial that the team gets superior efforts from the go-to players in order to taste success. “We’ve been harping about it all year long, but it’s so true. I don’t care what level you’re at, whether you’re major junior, pro or whatever, your best players have to be your best players,” said the Rebels boss. “As the games get bigger and tougher they have to get bigger and tougher mentally and make sure they respond the right way. Then everyone else has to fall in line and do their jobs. Where they’re at is in the playoffs, which not so long ago appeared to be a pipe dream. 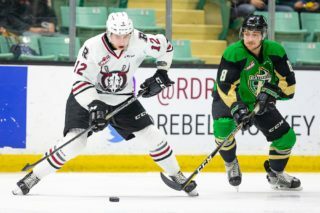 The Rebels have three regular-season games remaining — Wednesday versus the visiting Lethbridge Hurricanes, their likely first-round playoff opponents, and a home-and-home with the Kootenay Ice, whom Red Deer overtook for the final post-season berth in the Central Division, next weekend. Notable: The Rebels, who fired 30 shots at Bullion, swept the three-star selections, with Hagel, Anders and Reichel getting the nod . . . The contest raised $22,000 for the Kidney Foundation of Canada.